There are now more than 5million signatures on a petition calling for Article 50 to be revoked, making it the most popular petition ever submitted on the Parliament's website. What is more there are 39,764 signatures from Britons in France on writing this article - almost twice as many as in Spain, the country with the next largest amount outside the UK. Meanwhile, 5,174,439 signatures have come from UK residents, the data reveals. 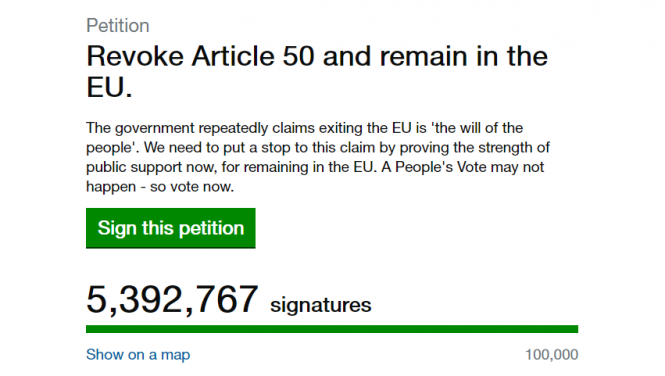 Shortly after 10am on Monday, there were 5,393,380 signatures on the petition that had been set up in February, but it went viral following Prime Minister Theresa May's badly received speech after last week's European Council meeting. According to the rules of the site, anyone can submit a petition. Petitions that get 10,000 signatures will receive a government response, while those that pass 100,000 are debated in parliament. The number of people signing the petition jumped ahead of Saturday's People's Vote march in London - and have continued to rise steadily since. Organisers said more than 1million people took to the streets of the capital. Former UKIP leader Nigel Farage has suggested that "Russian collusion" was behind the unprecedented traffic towards the Brexit petition. While the petition data reveals that signatures are coming in from all over the world - including small numbers from Russia, China, Iran and one from North Korea where it is unlikely the page can be seen - the UK government said that any British resident or citizen can sign, wherever they are. In 2016, shortly after the referendum, an online petition calling for a second EU vote was hijacked by automated bots adding false signatures. The House of Commons petitions committee said at the time that it had removed 77,000 signatures from the petition that garnered more than 3.5million signatures. Experts have said the requirement of a valid email address and a confirmation 'click' suggested that the latest petition has not been hiacked. The House of Commons petitions committee has refused to comment on its security checks but said the Government Digital Service uses "a number of techniques" to identify suspicious signatures and bot activity. However, bot activity could still be used to slow down or crash the platform, meaning people wanting to leave genuine signatures could be prevented from doing so. Meanwhile, the woman who set up the petition in February has revealed that she has received death threats. The Guardian has reported that Margaret Anne Georgiadou had received three threatening phone calls in the past few days, and had been forced to delete social media accounts following a 'torrent of insults'.